Why do I need integration between Tableau and OBIEE? The obvious question at this point is do we really need integration between OBIEE and Tableau? 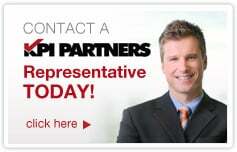 BI users of sales, marketing, customer support etc. adopted user friendly self-service BI tools such as Tableau Desktop in a big way. The reason is simple – Tableau is easy to use and has powerful visualization to bring insights to data. Suppose the business users of sales department who have knowledge of their systems and data flow can easily create Sales POV reports by just feeding Excel data into Tableau. But these analysts are usually kept waiting for a chance to make use of corporate data. In enterprises using Oracle E-Business Suite (EBS) and Salesforce as source systems, business users from the sales department would like to know what happens after an Opportunity is converted to an Order and then entered into Oracle EBS (end-to-end reporting). End of Quarter (EOQ) Operations reports are a classic example for this case. These analyses time taken for a Sales Order from the time it has been generated from a source to the time the Order is shipped and closed. However, they hit an insurmountable wall when trying to access the corporate data securely managed in traditional BI platforms such as OBIEE. The inability to connect these two worlds is a great barrier not just for the business users, but also BI teams. Most financial organizations are worried about the increasing data security risk from proliferation of Excel dumps. Analysts viewing a report in OBIEE do not have the capabilities to visualize the data the way they want or to blend data between different sources due to the limitations of the OBIEE tool. One great advantage of OBIEE is that it’s a common enterprise model with a semantic layer of many logical columns and calculations which have been added over the years. These calculations will take a long time to recreate in Tableau. Traditional waterfall model – Design, Develop, UAT and Deployment lead to tested and accurate visualizations leaving no room for bad data. There is no need to download data from OBIEE and load into Tableau. This reduces the security risk and the possibility of stale and wrong data. Blending of local data with OBIEE data is now possible. Lack of blending is a big drawback of OBIEE. Leverage Tableau’s vast array of features and beautiful visualizations with a backed up OBIEE sturdy design model. Ad hoc reporting by business users without relying on the IT team for development of visualizations that they need. Both the business users and IT teams are desperately looking for a solution that will bridge this great divide of Tableau plug-in play and OBIEE Enterprise solution method. The whole point of making the changes as described below is to allow Tableau to make joins between tables as we do in physical layer. 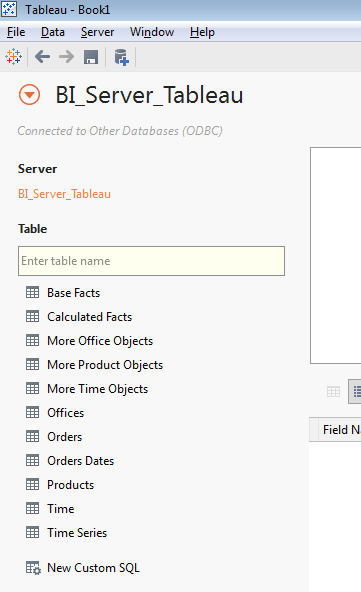 Before accessing subject areas built on RPD in Tableau using ODBC, there are few steps need to be taken care in RPD using OBIEE Admin tool. Open RPD either offline or online. If changes are offline, deploy the RPD to make sure the changes are available for Tableau when accessing using ODBC connection. 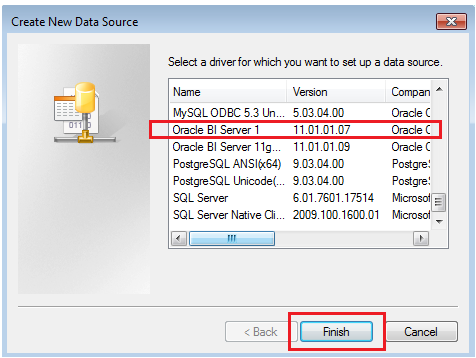 To establish an ODBC connection with the Oracle BI Server for accessing RPD Online, you must install a copy of the Oracle Business Intelligence Developer Client Tools (available from the Oracle website). We can use the same DSN even for connecting to Tableau using ODBC connections. After installing the client, follow the steps below to create a database source name (DSN). Business Layer (middle pane) — the layer where data modeling and logical relations and hierarchy creation are done. Presentation Layer (left pane) — the layer that is exposed to the business through “subject areas.” These subject areas are neatly modeled to expose data in an easy to understand format. 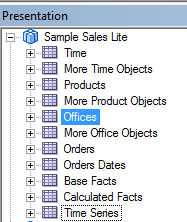 In Tableau, tables in the presentation layer are connected only as data sources. As shown in the screenshot above, if we want to create reports in Tableau using the Sample Sales Lite Subject Area exposed in Presentation Layer. Identify the Key Fields in Dimensions and Fact Table in Physical Layer of RPD and expose the same to respective Presentation tables in presentation layer of “Sample Sales Lite” Subject Area. Once connection made, we can see the list of tables available in Sample Sales Lite presentation layer in Alphabetical order. To read part 2 of this blog post, please click here.